Today, I’ve been just a little too sick to get much done, which is fairly demoralizing. It should take more than a sniffle to derail my plans. However, after a few small errands, I found myself wanting to curl up and sleep at work, and realized the likelihood of me getting anything done was slim. I’ve thus spent my evening perusing various online distractions, mostly art related. During my perusing, I noticed a trend in the pieces I was drawn to: all of them had tightly clustered bunches of collage. And then I thought back to where things went wrong last night. It was fine when I was getting ready to glue, but by the time I had more than a smidgen of paint, it went down-hill. So… maybe I’m overusing the paint? I’m still not sure how to proceed from here (or when I’ll have the energy) but I’m open to thoughts. Do I overuse paint? How can I incorporate this “collage cluster” thing that seems to appeal to me? And just what does one do about a yucky page? So I finished that page, but I am NOT happy with it, which is really disappointing as it was supposed to be the sort of page I could look back on and pick myself up if I was feeling low. Except… now I don’t even want to look at it at all. Figures. The page started with how I was feeling sunday night after Koby left. I was feeling really down, and just… lonely. Only it wasn’t registering in my mind as “I miss Koby.” It was translating as “Sigh. As usual, no one is there. I wish someone cared.” And then suddenly, I was flabbergasted. For over a week, I was literally INUNDATED with love. Countless hugs, sweet and uplifting words, little gifts, a really big gift, sitting with me through my back pain– basically, more than I could possibly quantify. My thoughts were entirely illogical. So… this page was a reminder to myself about the difference between missing people and being unloved. Only, as I said, I hate how it turned out. I wonder now if I should paint over it and redo it. It started out so well too. I used a background that was previously prepared, and when I laid the lined paper and scrapbook paper on it, it looked lovely. But then the paper didn’t stay white like I planned, and the lettering is awful, and then I kept adding, and it only got worse. So… I don’t know what I’m going to do now. I sketched it down, determined to do it later, in marker. I did, and it looked good, but it was missing something. So… I added. Unfortunately, the more I added, the worse it got. The words were somewhat fun to add, going every which direction, but they just detracted from any discernible focal point, rather than adding. I resigned it as a failure. But… I couldn’t leave well enough alone. I crumpled it, flattened it, wet it, crumpled it more, then tried stitching the words. Then… stitched a piece to mount it on (stupidly choosing to do it by hand, which took nigh close to forever) and stitched it to the backing (this time, by machine. I is smart artist!) The stitching added what I needed. I now declare it finished– and a long sight from what I intended. Two years ago, when I first took a serious interest in mixed-media, collage, art journaling, and the like, it was in part because I was mourning the lack of art in my life– a lack that occured because I’d get sooo frustrated with the quality of my drawings. I couldn’t shake perfectionistic tendencies, and I was no longer enjoying art. 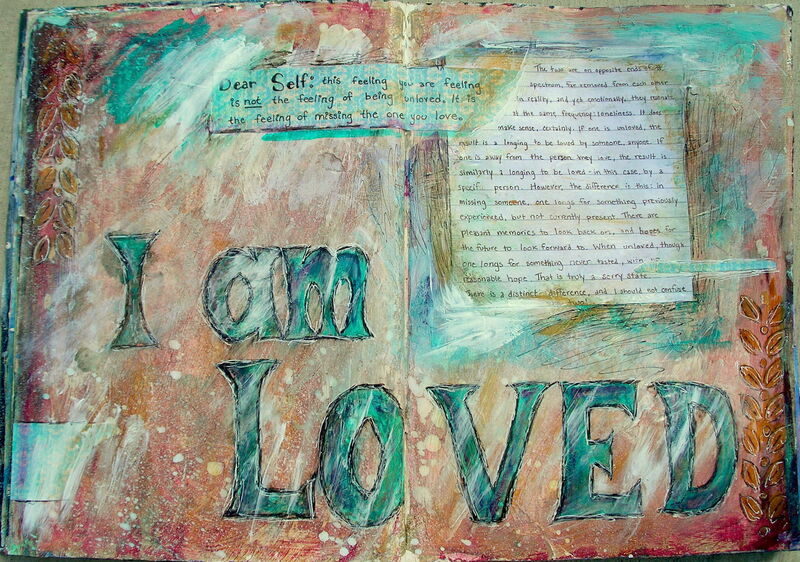 Art Journaling was supposed to be a way for me to escape that perfectionism, to take risks, and accept failure. It certainly didn’t start out that way, but I think I’ve reached that point. I’m bummed if a piece doesn’t go how I want, but it doesn’t leave me in a foul or dismal mood. The reason I still prefer mixed-media now is two-fold. First, its much more forgiving. A mistake need not be final. If you start with one medium, sometimes there’s simply nothing more that can be done with that same media to fix or mediate the mistake. However, by adding other media, you can change the piece. Second, its just more fun. Mixed-Media pieces almost always turn out more interesting– less perfect, yes, but still more interesting. There is a depth to them that is lacking in their single medium counterparts. Layers build up, and it adds a level of mystery, and compels the viewer to look a second and third time to take it all in. Persistence does pay off in mixed-media. Mistakes don’t have to be mistakes. You can add to them, and the layers build up, and change a piece– although not always how you think. Persistance must be coupled with a willingness to forego what you envisioned for what the piece will become. More often than not, the two are not the same. Sometimes the result is better than your original plan. Just have faith that -something- will come out of it, and don’t try too hard to dictate what. If a piece doesn’t seem to be going well, its probably either a lack of value balance (not enough whites, mediums, and darks) or a lack of a focal point (sometimes a result of the values being off). When in doubt, find (or add) a focal point, and check your values. Saturdays are a difficult time to get art done. For most, its the best time, but for me, its the worst. The kids are off school, and they are very…. clingy/irritating/easily bored/in the way/disruptive/every adjective that applies to middle schoolers. I love children, but once they hit that age, forget it. They should be sent to the moon cause you can’t do anything with ’em. Anyhow, any art I do today will happen late at night. I WILL work on some. I want to enter more challenges! In the mean time, I thought I’d post an art journal page I’ve been adding to a little at a time. There’s no actual journaling– yet. I will add some, but I’m not sure what, or if I should add more visual elements (tissue paper? Book pages? Some white? Play up a few colors? I don’t know.) For fun, take a look at what I have so far. Step 1:Choose a suitable page of text, preferably one that is nice and yellowed, like the one pictured. Using an extra-fine tipped felt pen, draw your map. I used my brown “Le Pen” pen, but the Steadtler fine tip pens in the picture would work, as would one of the new sharpy pens. As you can see, my map looks pretty pathetic right now. Just have faith and continue on. Trust me. I was worried too. Also, ten points if anyone can recognize what book this is from. Step 2:Using a medium to light brown colored pencil, shade the edges of the land (essentially, all the beaches). I shaded about half a centimeter in, then let the color fade out. Don’t forget to shade the islands too. Also, I shaded the sides of the mountains for dimension. Step 4: Using a dark brown pencil, shade just inside the lines, giving the effect of blending the linework into the colored pencil. The shading should be only slightly wider than if you were drawing rather than coloring. Step 5: Shade in the forest areas using a light green. It shouldn’t be much more of a tint, so don’t make it too dark. Step 6: Shade the perimeter of the water, along the beaches and around the islands using sky blue. Fade the color as it moves further from the edges. Step 7: Using a slightly darker shade of blue (even though you can’t tell in the picture for some reason, the pencil is a different color blue) outline the edges of the water, like you did with dark brown on the land. If needed, make and touch ups to the map (I did more shading with tan, and extended my sky blue further down so there would be enough for the card) and then set it aside. Step 8: Using your ultra-fine tipped felt pen, draw a compass rose. Now, if you are trying to draw one without a reference, its pretty intimidating. However, with a bit of guidance, its really not so bad. I created a mini-tutorial to help you along. Step 9: Using the dark brown pencil, shade in the darkest parts: the undersides of the East and West points, the center facing parts of the SW and SE points, and the undersides of the NW and NE facing points. Concentrate the darkness towards the center. Also, shade a bit of the North doo-dad (I forgot and had to go back and do it later). Step 10: Shade in the lighter shadows using the light brown. I shaded the right side of the North and South points, the top of the SE and NW points, and the tips of all the darker points. Step 11: Using tan, shade all metal parts (star points, rings, and North doo-dad) with tan, coloring over the parts already colored. Step 12: Lightly color over all metal parts with orange and yellow to warm up the colors some and make them seem more like gold or bronze. Step 13: I am a naughty tutorial maker. I should have done this in two steps, but I wasn’t paying attention and didn’t take a picture until this point. Oh well. First, I used blue to color in the center background segments, and then shade the edges of the outer background segments. Then I colored over both with robin’s egg blue, touching up with blue where needed. Then, I used robin’s egg blue to add just a bit of shading and dimension to the metal parts, mainly shading corners and darker areas. Step 14: Check to be sure your compass looks done. I darkened some of my shadows, drew in “creases” on the main star at NW, NE, SE, and SW, and lightly shaded the letters. Once you are satisfied, cut out, leaveing some edge around the letters and compass. You may also want to ink the edges, but do so carefully. Step 15: Here is where things start coming together. Cover the ATC base with the map drawing. Decide on placement of the compass (don’t be afraid of overlapping or letting parts hang off the edge) I already had an idea in mind, but I discovered one problem: the compass faded into the map too much. I tried blue tissue paper first, but the blue I had was too bright. I then tried a bit of white, and it was a perfect balance of translucence and visibility, and the wrinkled/torn look added to the feel of the card. So I arranged the two, and glued them down. Step 16: I tried folding back the excess edges (don’t cut! It leaves raggedy edges) and I noticed the eye was wondering right on out of the top corner. Can’t have that! So, I used another scrap of tissue paper to provide a barrier. The bottom right looked a little bare, so I chose a fleur de lis style flourish stamp and stamped it in brown. I stamped it faintly in the top left corner too, but you can barely see it. Step 17: Through the whole project, I was trying to choose a quote, and I wanted something related to adventure. The first part of this kept coming into my mind, but it said blue to me (like flying in the sky…) not maps and such. I had a few other ideas, but when I went searching, and I saw the full line, and I decided it was perfect afterall. Now is the time to write it out. Decide on where you want it broken up (each word? each letter? phrases? if so, which?) and write it out as such. Make sure you write it small enough. Also, if you’d like, tint the paper. When I wrote it the first time, I tinted it a light blue with prismacolor markers, but it was too large. The second time, I decided I liked white better. Step 18: Last step! Cut out words, ink the edges with brown, and decide on placement. I chose to have mine somewhat follow the torn edge of the white tissue paper, and group by phrases (as two phrases were split into two segments.) Play with it till you find something that looks good and reads right. Glue everything down. Fold any excess edges from tissue paper or compass onto the back and glue them down as well. Finally, ink the edges with brown. Voila! Done. I hope you enjoyed it, and maybe found a bit of inspiration. As always, I’d love to see anything you make. Drop me a link and I’ll take a look. P.S. Take a look at my other ATCs. I’ve been a naughty blogger and haven’t been updating on my artistic pursuits. Shame, shame. Part of it is I’ve had some distractions, although artistically oriented. Part of it is, I’ve had this post in mind and wanted to get it done before I moved on, but I was too lazy to get to a scanner. Back in January, I started preparing background pages for an art journal. Since I am notorious for starting a journal and leaving most of it blank, I decided that instead of starting with a book, I’d make the book as I went. I cut paper into 7×5 rectangles, gessoed both sides, and started preparing backgrounds onto which I could paint, draw, collage, write, stamp, etc. I wanted them stiff, so I could bind them with binder rings and not have to worry about the logistics of construction while working on the pages themseves. I may only use one binder ring in the corner, I may use 3 along the side, or 2. I’m really not sure. Here is a sampling of my backgrounds, as they are at this point. For the fun of it, I’ll share my process, unplanned though it was. Once I had the paper cut, I started out with pretty generic, boring gesso applications, via paint brush, then started to get more creative. I dug out one of my old college ID cards to use as a palette knife (you know you’ve moved on when you use your ID to spread paint/gesso). I tried spreading it in glops, drawing in it, writing in it, making designs with the brush, and anything else I could think of. When all pages were dry, I used my very expensive, professional grade watercolors (also known as a cheap crayola kiddie set) to paint the pages. Watercolor behaves interestingly on a gessoed surface. It moves around quite a bit, as the surface isn’t as porous, and when dry, has a matte finish. Its easy to rub off or move around with a damp cloth or paint brush, and splattering paint onto an already painted page yielded some nice results. The trouble is, when you put mod podge over it, it disturbs the paint as well.Mod Podge also makes the colors a bit brighter and shinier (even when using the matte variety). Some might like the brighter colors, but I like more muted colors, and I prefered the matte look. In the future, I will probably get out my acrylic paints and skip the watercolors, but I was lazy. Its so hard to pull out too many supplies when I know I only have a few hours before it has to be put away. Oh well. It was a learning experience. As stuff is going on top of it, I suppose it doesn’t much matter if its too shiny or if my textures were altered. I had fun at any rate. Feel free to try the same. Expect to see development on these pages from time to time.